At the end of a day spent outside, there’s nothing better than sitting down to a relaxing meal. 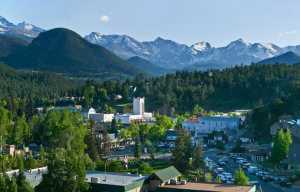 And whether you’re a foodie looking for tastes unique to the region or a family that wants something everyone can enjoy, you’ll find it in Estes Park. 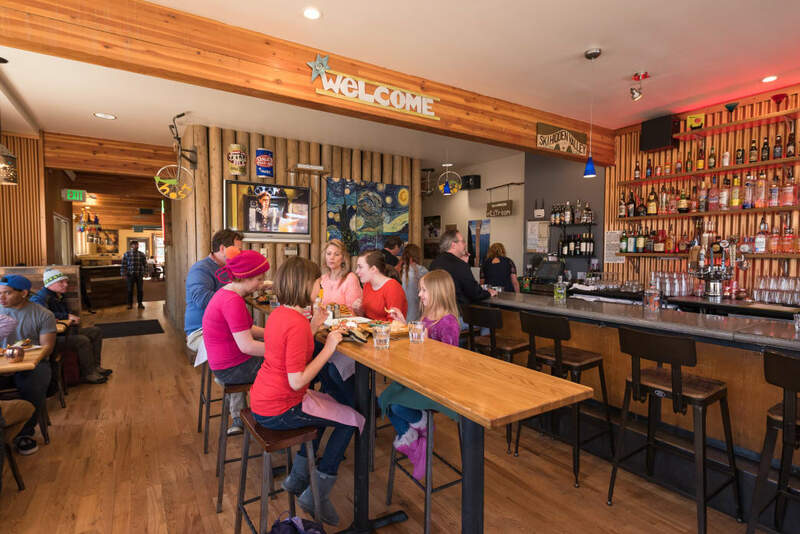 The wide variety of locally owned restaurants offer dining experiences that are about more than just the food: Estes Park is filled with restaurants in cozy cabins and historic buildings that date back to its pioneer days. Add a locally made bottle of wine or your favorite Colorado craft beer and you’ve got a meal that you’ll long remember. 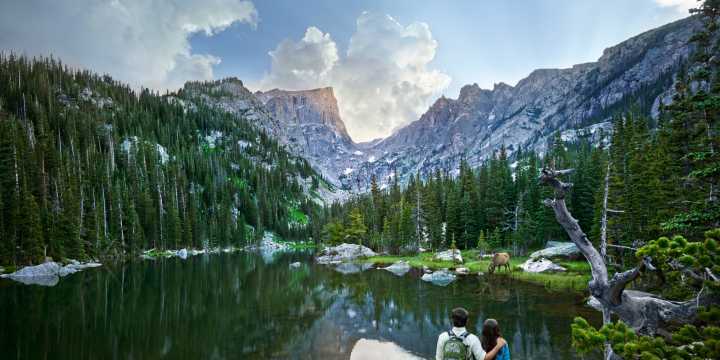 So work up your appetite exploring the wonders of the Rockies and then settle in for a hearty meal in this picturesque Colorado mountain town. Since we already got your attention with these two Ws, let’s start there. When the fall colors are flourishing, Saturday crowds flock to Smokin’ Dave’s, and the place stays crowded through the evening. While dining space is easier to come by in the winter, the sumptuous flavors of the slow-cooked meats remain the same. A local institution known for its great wings with three sauce options (if you like spice, go for the Thai), Smokin’ Dave’s is an excellent lunch or dinner option for adventurers craving protein. The pulled pork and brisket rivals any you’d find down South, and creative items like the Wild Salmon Reuben keep the red-meat abstainers happy as well. 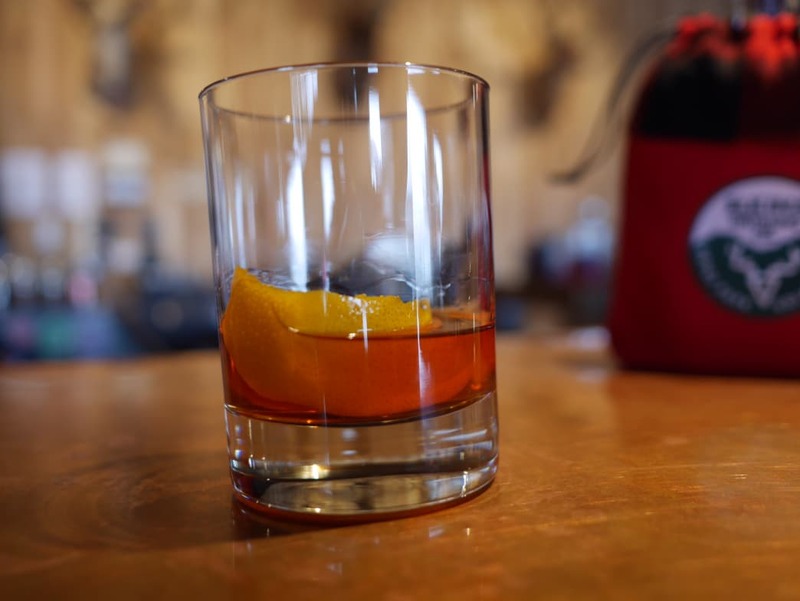 As for the liquid W, even the most well-sipped connoisseurs had better plan to saddle up to the bar at The Stanley Hotel for at least a week if they want to make even a small dent in the venue’s famed whiskey collection (which features more than a thousand bottles). The art of brown liquor doesn’t get any more local than at Elkins Distilling, which carefully crafts its own brand of Colorado (and corn) whiskeys. The Mountain Home Café is home to pan-sized breakfast plates that will allow you to skip lunch if you’re planning a big day in Rocky Mountain National Park. Not sure what to order? Anything with the homemade green chile is the right answer. Even the most discerning sweet tooths will roll over for the donut holes at the long-standing Donut Haus, which has been delighting visitors since 1975. If you plan on burning a lot of calories during the day, indulge in a cheesecake roll, which features a lightly fried butter roll topped with cheesecake and cinnamon. Let’s be honest—everywhere is pretty casual around here. There is no call for heels or ties in Estes Park, especially in the winter. The Wapiti Pub is everyone’s go-to for nachos (and Rocky Mountain Oysters, if you dare) as well as ample beer options, including a wide selection of Colorado craft favorites. Estes is also home to a small Nepalese community, its culinary prizes include Nepals Café, whose coconut curry chicken will thoroughly warm even the coldest of bellies. You can also take your spice hankerings to Himalayan Curry and Kebob, but beware of how high you go on the hot meter. For Mexican, El Mex-Kal is as authentic as it gets in the high Rockies, while the beloved Ed’s Cantina puts a local spin on its cocktails and traditional dishes (think Bison enchiladas and bacon-wrapped jalapenos). Many people’s love affair with the cozy and unassuming Claire’s begins in the morning with a mountainous benedict (the Cuban is particularly delicious), continues through lunch (choose a burger, any burger), and lasts until dinner (the meatloaf or stuffed trout are proven faves). Bird & Jim calls what it offers “modern mountain dining from an ingredient-driven kitchen.” Those who visit for lunch, dinner, or Sunday brunch will be treated to a creative menu that’s focused on season and local ingredients sourced mainly from Colorado farms and artisan food suppliers. You won’t be disappointed by the ever-evolving menu that features steak, seafood, game, and pasta. Also partnering with numerous local farms and purveyors, Seasoned lives up to its name in dishes determined by seasonably fresh ingredients that are reliably bursting with flavor. Open only for dinner, Seasoned is consistently ranked by foodies among Colorado’s top restaurants. The Dunraven Inn has been a not-to-miss hot spot for Italian comfort food going on 50 years, and Twin Owls Steakhouse is the ideal candlelit cabin to try a simple but sumptuous dish of local game. 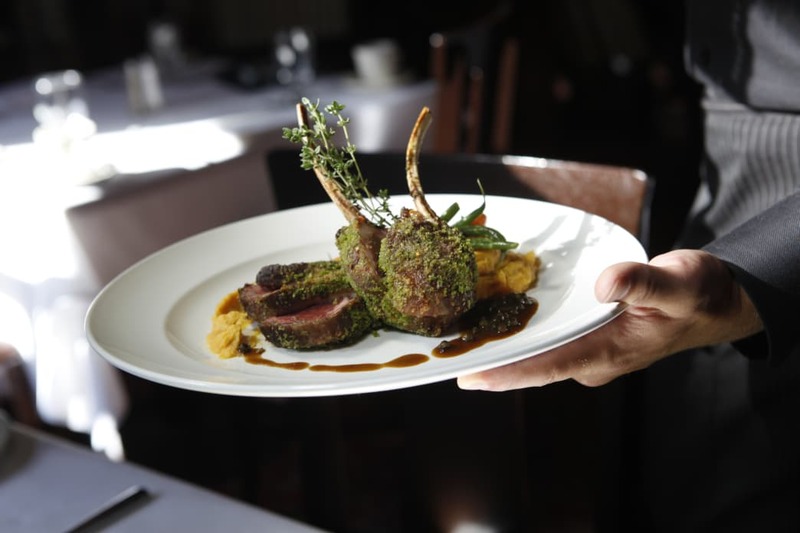 For fine dining, you can’t forget The Stanley’s Cascades Restaurant, which features a steakhouse-style menu with favorites like Colorado game meatloaf, filet mignon, and grilled elk loin. When weather permits, you can dine on an outdoor covered patio with a view of the Cascades Waterfall. The Rock Inn is a local institution that dates back to the Great Depression when it was a big band dance hall. It has maintained its happy tavern appeal and still hosts a steady lineup of live musicians. 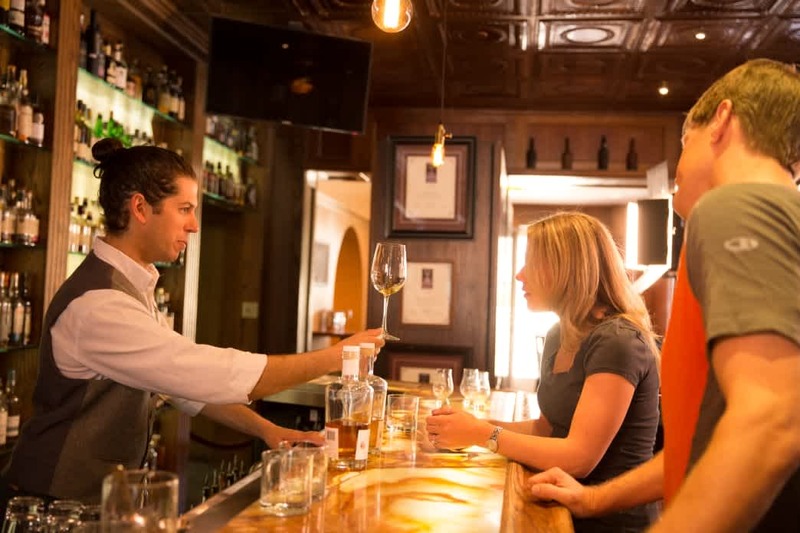 You’ll find a wide variety of Colorado craft beer and spirits—and an exquisite filet mignon. For truly local craft beer, there are, of course, a handful of in-town breweries. Try the Estes Park Brewery, with tasty pizza to rival its suds. 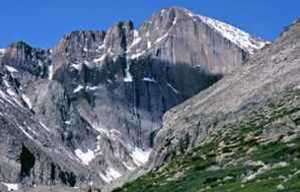 Beer snobs of all types will enjoy the creative concoctions at Lumpy Ridge and Rock Cut, While Colorado is recognized more for its grains than its grapes, Estes Park is also home to its own Snowy Peaks Winery, which produces tasty blends from grapes grown on Colorado’s Western Slope. And, of course, don’t forget Elkins Distilling for its locally made whiskeys. In sum, your stomachs have a lot of ground to cover here. Just make sure your legs keep up!